The Tooth Whitening methods - Tooth Fairy GmbH - "Style Your Smile"
Tooth Fairy has produced two types of Tooth Whitening Methods which will enable you to provide the Tooth Whitening service to all your clients. Due to our dental professional knowledge we know every client is not the same therefore providing you with two methods in your initial Tooth Whitening Starter Set you will be able service all client’s properly. We are the only company on the market which offers two Methods. Our Tooth Whitening Starter Set contains 20 Tooth Whitening Kits from Method 1 and 5 Tooth Whitening Kits from Method 2. Profits will be made from your initial purchase of our Tooth Whitening Starter Set. Tooth Fairy has the lowest reorder prices on the market for your Tooth Whitening Kits. Method 1 is chosen if the client’s teeth are without extensive dental work within their smile zone. This method is performed by simply filling a bleaching tray with gel, sliding it into your client’s mouth, shining the LED light onto the client’s smile zone and programming the LED light. You will program the LED light for 15 minutes repeating the procedure 2-3 times for one treatment. Method 1 will increase the whiteness of the client’s teeth 3 to 7 tooth colour shades. Method 2 is chosen if the smile zone has caps/crowns/dental porcelain or dental fillings, the client has a strong gag reflex, extremely yellow teeth or if the whitening tray does not fit properly. This method is performed by pulling the client’s cheeks away with a cheek retractor, painting the gel directly onto the teeth and programming the LED light for 10 minutes repeating the procedure 2-3 times for one treatment. Method 2 increases the whiteness of the teeth 4 to 8 tooth colour shades. 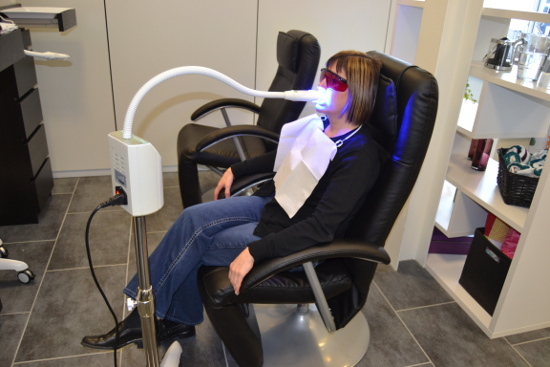 The LED light is shining directly onto the teeth when using Method 2 producing whiter results. Method 2 allows you to colour match already existing dental crowns/caps/dental porcelain or dental fillings that are whiter in colour than other teeth resulting in a beautiful same shaded smile. This treatment allows you more control over the change in tooth colour since you can decide where the gel must be placed. Some people have a tooth that is a different shade than the others and you place the gel only on this tooth when needed.